Following the example of some of my good friends here, I have indeed picked myself for my first interview. Really, it seems like the perfect way to introduce myself to you fine people and perhaps give you insight on how/why I pick certain authors/stories in the future. I'm sure my interview questions will change as I continue to learn through my new role here, and I encourage everyone to submit suggestions of authors and stories you'd like to hear about - keep in mind I'm in charge of crossovers and suggest accordingly! I pretty much read crossovers exclusively and I'm always up for pairing new fandoms/characters together - I love the challenge of writing them and the joy of reading a well-written one! So now... on to the main course! Where do you like to post, and can you give us the site of your preferred medium? I post at fanfiction.net, fictionpad (though don't tell anyone, I'm behind!) and eventually I'd like to post at TWCS. Also, I have my own Wordpress, which is definitely my preferred medium as I can literally do whatever I want there: bertiebottwrites.wordpress.com. What do you prefer, Tea or Coffee? Coffee!!!! Soooo much coffee! I chase after two young kids during the day and couldn't do it without my Cup 'o Joe! What is your favorite beverage of choice? And if alcoholic and mixed, what are the ingredients? I actually drink a lot of water, but if I'm feeling frisky I like to keep it simple with bourbon and coke. What is your funny story about trying something to drink and it rocked your boat and/or sucked? When I turned 21, my first beverage was a Long Island Iced Tea – which is, of course, wicked strong. I would say it not only rocked my boat, but also my friend's since I tend to be a very happy, talkative tipsy person. What foods do you love? Love Chinese food, but also can't go wrong with a good 'ole meat and potatoes. What is your go to food for comfort? Rolos (milk chocolate covered caramel)... I gravitate to them whenever I need a pick me up. What do you like to snack when writing? I don't typically snack while writing – I'm a distracted writer so I try not to give myself reasons to be even more distracted. Is there a scent that says home to you? Lavender and vanilla... I tend to use it (sparingly) whenever I clean house in order to mask that sterile bleach-y smell. Is there a scent you wish you never smelled ever? Skunk, or more specifically, roadkill skunk. I could definitely live without ever having smelt that. If you could visit a place, anywhere, where would it be? Italy. I'm almost ¾ Italian and would love to visit Italy – the birthplace of the Renaissance! If you could go at any point in time, which would it be? Probably the Renaissance, though more for witnessing the birth of such a vibrant changes in culture and art... I wouldn't last long without modern conveniences though! What music do you like? All types – seriously, my iPod is so eclectic. I have opera, musicals, rock, comedy, just everything! Is there a genre or song you hate? I don't really hate anything, but I don't listen to as much country or rap as I do everything else. Tell us something about yourself that you think your fans would love to know about: Ugh. No pressure! Well, I'm actually a published author. Nothing big, but I've had a few poems published in literary magazines and have a creative non-fiction essay that is due to be published in the summer. I majored in Creative Writing in college, so in the midst of fanfiction, I'm also pursuing my original fiction. Why did you start writing? For the freedom. I've been writing creatively since the third grade when my brother was seriously ill, and it afforded me an escape. It made me feel better, stronger, to be in control of my own world. What do you enjoy the most about it? I'm very fascinated by the rhythm of words and pairing unique adjectives with nouns. I like to make descriptions that are visceral and unique. Truly, I've always loved words and the power they lend you. What do you like least about it? The time. I have a husband and two kids and never have enough time to write as much as I want. I take the time I can get, but I wish google or someone would create a device that would read my mind and type everything out for me. That first time hitting publish, how did you feel? Elatedly terrified, lol. Most of us put sooo much of us in our work that it's almost like we're putting ourselves on public display. In particular with Thirsty for Your Love, I was nervous having never written a crossover before and with Set My Soul Alight I knew I was taking a big risk by merging two very different fandoms. Where do you get your inspiration? Dreams more often than not, although I also feel inspired by reading other great authors. Obviously, I'm not stealing their ideas, but sometimes I'll read a different pairing than I usually prefer and fall in love with it and think, hey – why don't I give that a try too? Oddly enough, that's how Thirsty for Your Love was born. I read Kittyinaz's You're All I'm Asking For and just fell in love with the pairing (Bella/Damon) to the point I knew I had to write something. What is your writing area like do you use computer or paper, or both? Or another medium? I have an open office that faces into my living room so I can keep an eye on my kiddos. It used to be very cluttered, but I've recently cleaned it out and it was like cleaning out my head too. I tend to use the computer almost exclusively, except for when I'm out and about and have to jot down an idea or when I'm writing poetry. I tend to write my poems in a journal and in cursive. Do you use an outline, rough draft or just write? Typically I just write at first, get a feel of my characters and plot. Then, I'll create a rough outline (always subject to change) with most of the major points. What do you do while you're writing (listen to music, TV in the background, etc.)? I always need background noise. Until recently, I'd just have the TV on, but now I listen to music. With Thirsty, I'm all about Poets of the Fall – an awesome band my friend Kittyinaz got me hooked on. With Alight, I've gravitated towards Imagine Dragons. What annoys you the most when you are trying to write? When people read over my shoulder – drives me bonkers and I can get downright nasty about it. If you have finished a fic, what was your feeling on it? I have one finished fic (Carpe Diem, a Harry Potter story with Tom Riddle/Hermione Granger pairing) and truly, it brought me to tears when I hit complete. Happy tears, of course! It was such a labor of love and I had to take a long hiatus, so I was scared coming back to it, but it was like slipping on a warm coat. It fit perfectly. What are your favorite fandoms to write? I've written Harry Potter, Twilight, Vampire Diaries and Avengers... I'd have to say my favorites are Vampire Diaries and Avengers. I love Damon (who doesn't?) and have a deep rooted love for comic books too. Who are your favorite characters to write Hands down – Damon. I swear, he talks to me and has become my muse for stories he's not even featured in. Loki is a close second because he's so complex... he's a bit darker though. Why? I've never had a character that spoke to me as easily (and loudly!) as Damon does. He literally lives in my head and plants plot seeds. Some of my best scenes weren't planned and just came to me in his voice. Who are your least favorite characters to write? Maybe Bella, though I don't really mind her too much. Why? I try to stay as in character as possible in my crossovers, and unfortunately, that means Bella starts off weak-willed and needy. She tends to grow up in my fics, which is both fun and a joy to write, but I do tend to want to smack her at first, lol. What is your favorite scene or story you have written and why? This should be down with the hard questions – you're asking me to pick my favorite child! If I had to choose... ugh! I love Thirsty for Your Love because it's rekindled my fanfiction writing, but Set My Soul Alight is so unique and there's not a lot out there like it so it makes me feel very proud for taking the risk in writing it. There – that's the best answer you're gonna get! What is the most difficult story or scene you have written, and why? Hands down, my first lemon in Thirsty. There's the obvious in that it was my first one, but I also really wanted to find a balance of the physical and the emotional without being too heavy or cheesy on one side or the other. Which ones and whom? I've always been quick witted and easy to fire a comeback. I'd say I'm like Damon in that sense. Sarcastic, but often using it to cover some real, deep emotion. What do you like most about your preferred fandom? I love writing about the supernatural world – vampires, witches, superheroes... the skies the limit and I love that I don't have an imaginary line I can't cross as far as believability goes. I always strive for realism even in the fictional world, but I love being able to create the impossible. How would you describe your fics? 'How Bella Got Her Groove Back' – lol. So far, I tend to have Bella at her lowest, struggling to find herself. I suppose they're coming of age stories, but also romance. I'm a romantic at heart. What story would you recommend of your own for a new fan to start first? Probably Thirsty for Your Love if only because it's about 7 chapters away from being complete so you won't be left hanging, lol. I finish all my stories, but as a reader myself, I completely understand the feeling that comes with hitting the next button and nothing happens. If you could offer a suggestion to someone who is thinking of publishing their first story, what would it be? Just do it. Ignore all the voices in your head telling you all the negative possibilities and do it. I've always found that oneself is the largest obstacle to overcome in any creative endeavor, so just ignore your inner critic, buck up and get to it. You can do it! If you could go back in time, and give yourself one word of advice, what would you say? (No Lottery numbers or anything like that!!!) If we're talking advice in the writing world, I'd say exactly what I wrote for the previous question. As far as life in general, I'd remind myself of a song lyric from Avenue Q, “except for death and paying taxes, everything in life is only for now.” Don't sweat the small stuff because in the long run, they won't even be a blip on the radar. Tell us what you read! I read ALL of Dr Harleen Frances Quinzel's crossovers on fanfiction.net: https://www.fanfiction.net/u/5350628/Dr-Harleen-Frances-Quinzel. There's not a lot of Twilight/Comic Book crossovers and she writes so many of them. If I had to pick one to read first, I'd recommend her Wolverine one... or Deadpool if you like dark humor. Are they in character or Out of Character? I try to keep him as in-character as possible, but like any crossover story, some out of character traits are impossible to avoid. Date of Birth: Unknown, though the humans call them gods and believe them to be immortal, Odin quite clearly expresses that they can die even with their excessively long lifespans. If we go by mythology alone, Loki must at least pre-date the Vikings. 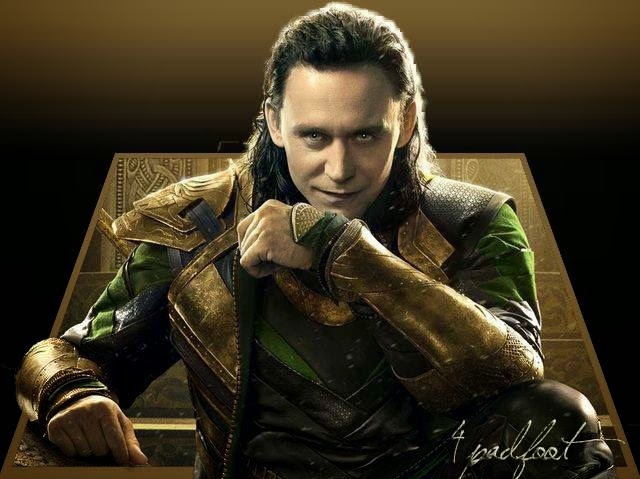 Stats (Aka Height, hair color, eye color, and so on): For me, Tom Hiddleston embodies Loki. He's 6'2”, black hair (at least while in character) and blue eyes. He's so pretty you can't help but to love him even when he's doing bad things! Any noticeable Scars, Tattoos, or other markings: No, nothing. Loki doesn't believe in marking his already perfect body. Only thing that happens is a slight skin reaction to the cold since he is half Frost Giant. If they could have a Theme Song, which would it be? Imagine Dragons, Radioactive – it's actually what I listen to when I write his POV. What is their favorite Movie? A Clockwork Orange, because it hints at the superiority and class of the 'bad guy' and also implies a victory of sorts for him in the end. What is something that the fans don’t know about your character? He wears several masks... some are obvious, but they all protect a very tender and needy heart. That's it for me - it's a pleasure meeting you all and I look forward to introducing you to some really awesome writers and stories in the future! Love this!! And thanks for the shout out!! !